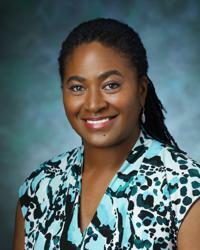 Nyela Amadi is a Certified Nurse Midwife at MedStar Washington Hospital Center. She specializes in normal, low-risk antepartum, intrapartum, and postpartum care, as well as gynecological and contraceptive services. Nyela’s practice focuses on family-centered holistic care, open communication, and education. Her goal is to foster confidence and empower women to make informed decisions about their care and their bodies. Nyela received a Master of Science in Nurse-Midwifery from Shenandoah University in Virginia.